Electrical Contractors, Inc. (ECI) has been family owned and operated since 1986. 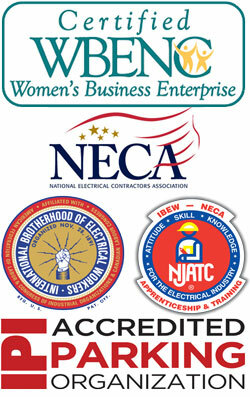 We are a certified women’s business enterprise (WBENC) and an IBEW contractor. We are fully insured with an A+ rated company. Employees are OSHA certified and we have up to date safety and hazcom programs in place. ECI is a full service provider that installs state of the art vehicle access control systems for hospitals, universities, hotels, municipalities, parking management companies, general contractors, corporations, airports and private owners. Our company is known for reliability, quality of work and the ability to provide turnkey projects. Custom electrical installations for residential subdivisions and custom homes are also an ECI specialty. We emphasize quality workmanship by trained professionals. Working alongside general contractors and custom home builders we help make home owner dreams a reality. As a testament we are still working with our two very first customers! ECI is an IBEW contractor associated with all locals throughout the Chicago metropolitan area. Affiliation with NECA, National Electrical Contractors Assn., gives you the assurance your project will be completed by the most highly trained electricians in the industry.